"Your Samba class is a lot of fun." "What a fun way to get a good workout! I feel great!" "Dancing Samba really helped relieve the symptoms of my multiple sclerosis." 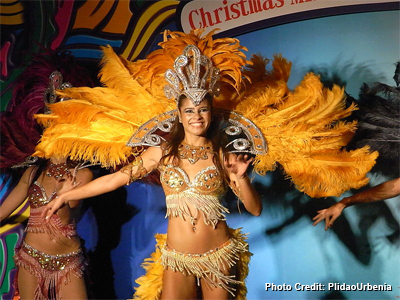 "Every time I dance Samba I feel alive and I noticed that I'm much happier." "You're a great teacher. You make learning to dance Samba easy." "Oh, this is so much fun! You have to try it. You'll love it!" "I'm always in a better mood after my Samba lesson with you. You are breath of fresh air." "I havn't laughed so much in years. Every Samba lesson is party! Ai-yi-yi!" "You really know how to make me shake by booty. You are so much fun, fun, fun!" "You are so inspiring. Learning how to dance Samba with you increased my confidence. Thank you!" Born and raised on the outskirts of Rio de Janeiro Elizabeth, like most carioca's, learned to dance the local flavor of Samba as a child. At the age of 15 her aunt initiated her into the true art of Samba dancing. Samba is a Brazilian dance and musical genre originating in Bahia and with its roots in Rio de Janeiro, and Africa via the West African slave trade, and African religious traditions. It is recognized around the world as a symbol of Brazil and the Brazilian Carnival. Considered one of the most popular Brazilian cultural expressions, samba has become an icon of Brazilian national identity.